Don’t Feed the Alligators » Blog Archive » Ask the Readers: Whose leaves are they anyway?? Ask the Readers: Whose leaves are they anyway?? We had a slight altercation this week with the neighbors. As I sat to eat breakfast I looked out to the sound of leaf blowing. I was somewhat astonished that my neighbor (a renter of the house next door) was blowing the leaves from his side yard into my driveway. Now I may have not noticed this new pile of leaves if not for the fact that we had cleaned up the whole back, side yard and driveway over the weekend and had filled about 15 leaf bags. Trusting in the decency of humanity I made the assumption that he was putting the leaves there for ease of picking them up after he was finished. Plus with a toddler covered in syrup I was in no position to run out and approach him about the situation and what his plans were. Fast forward a few days. The leaves sit where they were blown, in our driveway. The landlord for the property is parked in the driveway. I run out to have a word with him. I calmly explain that his tenant had blown leaves into our driveway and I did not appreciate that since I had already cleaned all my leaves and the leaves in his side yard were his responsibility. He proceeded to tell me (remember I am 8 months pregnant) that they were my leaves because they fell off my tree and it was only fair that I picked them up. He also told me that he is a very busy man (aren’t we all) and didn’t have time for fall maintenance. I told him it is not my fault that leaves from a tree in my yard fall into his yard. Unfortunately that is how leaves work. My mother-in-law knows this all too well. The winds are never kind to her and leaves often end up piling up in her yard regardless of where they fell from. Of course MITBeta was not very happy with this outcome and being the diplomat that he is went back out to have a word with our neighbor’s landlord. As I watched from the window I saw them chatting for a while and then I noticed them picking up the leaves together. It took them about 10 minutes total and MITBeta reported back to me that the landlord had apologized to me for our earlier conversation. What do you readers think? We feel that raking leaves is an unfortunate but necessary evil of having glorious shade. It’s Murphy’s Law that he who has no trees will have all the leaves blow into his yard. But I’m pretty sure the leaf code suggests that I do not need to go get those leaves from my neighbor’s yard. We like trees and will suffer with fall clean-up because we are too frugal to pay someone to do it for us, whether I’m pregnant or not. How about you? Do you loathe raking? If you own properties, do you use a landscaping company to clean your properties? This entry was posted on Monday, November 24th, 2008 at 11:33 am	and is filed under Ask the Readers, Household, Rental Property, Stories. Both comments and pings are currently closed. Congratulations on being able to address this situation without losing your cool. Don’t think I could do that! Cool heads prevail…that’s great. We have someone coming to cleanup the leaves today and it KILLS me to have to pay someone, but unfortnately we have no other option right now with time available vs. size of job required (we have a lot of leaf shedding trees and a sizeable back lawn.) Every year I do the quick math about investing in the mower, leaf blower, trimmer, etc. weighed against available time and have yet to pull the trigger…my free time is just too valuable and in demand right now. But that value proposition could change at some elastic point or with some sort of event…Hey, maybe I could convince my neighbor to help me out…Now THAT negotiation would take some serious skill!! I had always thought that any part of a tree that hangs over someone else’s property was considered “theirs”. I think that they have the right to cut that part of the tree but it would probably depend on whether such trimming would damage the tree irrevocably (e.g., killing it). So, they would also “own” the branches with their leaves. The web site http://www.enotes.com/everyday-law-encyclopedia/boundary-property-title-disputes says “Leaves, bean pods, or acorns which fall off and end up on adjacent property are considered a natural occurrence and are the responsibility of the landowner on whose property they ultimately come to rest.” That also means leaves from someone’s tree down the block blown into your yard would be your problem. Of course, if folks are “neighborly”, then they will account for the impact their grounds-keeping has on others and will take care of such items before they cause problems. Another web-site, http://www.wwlaw.com/neighbor.htm, goes further and covers overhangs and the special case of “boundary trees”. So are you suggesting that it would have been “neighborly” of us to go over and rake the leaves as well, or did I read that wrong? Okay, first of all, the picture in my mind of the toddler covered in, of all things SYRUP is hysterical when considering that she would have come in looking like a leaf monster!!! Second, though, it is absolutely preposterous to think that someone would “return” leaves to you. If you found a McDonald’s cup in your yard, would you bring it back to McDonald’s and throw it in their yard because it obviously came from there? No. Seriously. The leaves belong to whoever owns the ground underneath them. I have a big maple tree in my back yard that drops leaves pretty much only in my back yard. But across the narrow street in front, and right next door to me front, both neighbors have big maple trees the drop leaves on my tree-less front lawn. I would never assume that they should pick up those leaves. After all, if you lived next door to a forest, would you expect the squirrels to come pick up the leaves that are blown from their trees? As a matter of fact, when I came home one day to find that my neighbor had cleaned the leaves off his front lawn next door (under his big tree), it inspired me to blow the leaves off my front lawn and mulch them for my garden, specifically so that they wouldn’t blow back onto his lawn, even though they were from his tree. It’s simply part of being a home owner and a good neighbor. Thanks everyone for the great feedback! I hate leaves. After putting about 15 hours of cleaning up my front lawn - 4 times and counting, my wife (Julie) happened to bump into my neighbor who was having his lawn cleaned up “professionally” again. Well,the rest is history. $100 and about 2 hours later my front, back, side lawns were clean as a whistle. Best $100 I ever spent although I am told we got a deal. Considering it would probably take me another 15 + hours it was money well spent. I generally do not like paying people to do what I can do myself (which isn’t much) but this was an exception. Our house has numerous oak trees as do the surrounding house lots(oak trees are God’s way of punishing us for actually sitting in the shade for a few minutes during the summer). 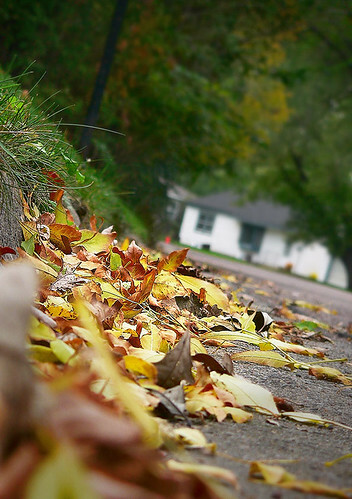 It’s easy to figure out who’s leaves are whose - If it lands in your yard - it’s yours. The idea that a leave from your tree is your responsibility once it leaves your property is ridiculous. I am glad to see that this situation was resolved amicably in light of the initial attitude from next door. Rick: What’s the point of having teenagers? Buy them each one of these: Slapshot Lawn Rake. Your post does bring up a good topic, though, about the true “cost” of various kinds of services. 30 hours to do a job that would have cost $100 total comes to $3.33 per hour. I’m sure your time is worth more than that — but is that true only if you could have actually been collecting more money somewhere else? How does one put a monetary value on time that would not otherwise have been spent earning?